Chiropractic is a form of health care that is designed to treat the whole health of persons who have trouble with their neuromusculoskeletal system. While chiropractors are best known for treating back or neck pain, the range of chiropractic medicine goes far beyond this and can treat a variety of disorders and addresses various pain all over the body without the use of drugs or medications. Sports injuries are among the most popular reasons why people seek chiropractic care in Westlake Village. These injuries can range from repetitive motion injuries, such as tennis elbow, or shoulder injuries involving the rotator cuffs, to stress fractures and bone spurs caused by repeated impact. Often these injuries are preventable or at least have the potential to occur less often if the patient takes an active interest in participating in their own care. Getting injured in a car accident is complex from both a legal and medical standpoint, and many are turning to chiropractors to help them accurately present their injury in their insurance claim, especially if they do not bear the brunt of fault for the accident. Although many injuries may be treated with chiropractic care in Westlake Village, whiplash is among the more common injuries that send car accident victims through our door. Symptoms of whiplash include neck pain and stiffness which gets worse with movement, an inability to properly move the neck, headaches that start at the base of the skull, arm numbness, dizziness, and fatigue. Doctors of chiropractic are specifically trained in diagnostics and will make referrals to other healthcare providers when problems occur with a patient beyond their own personal capabilities, and they often work in cooperation with MDs. A few of the more common incidents that lead many people to seek the advice and treatment of a chiropractor in Westlake Village include sports Injuries and car accident Injuries, including whiplash. At Duben Holistic Chiropractic Center in Westlake Village, CA our chiropractors, Dr. Alan Duben, and Dr. Lindsay Erickson use a whole person approach to their treatment and often incorporate nutrition and lifestyle advice into their treatment plans to help their patients achieve the best level of overall health they can after a sports injury. They also work with patients to target their training in order to strengthen the core and other muscles in order to decrease the amount of demand placed on the musculoskeletal system. 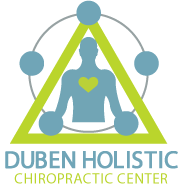 At Duben Holistic Chiropractic Center in Westlake Village, CA, our chiropractors can help with all these symptoms and more. If you find yourself feeling pain and stiffness or have been involved in a car accident, contact us at 805-468-4437 to set up an appointment today.